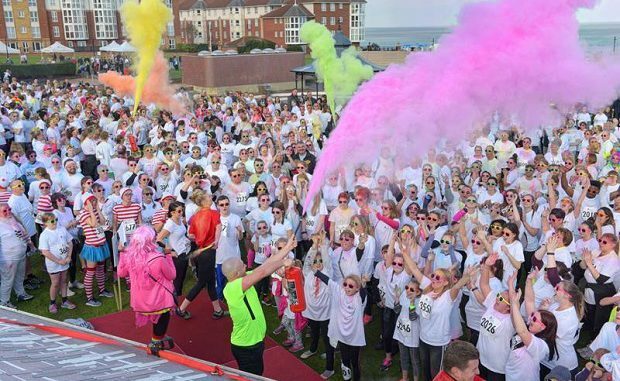 The Pilgrims Hospices Thanet colour run is back and people are being invited to sign up for early bird registration. The family-friendly 5k run on October 21 starts and finishes at The Oval, Eastern Esplanade, Cliftonville and the route takes runners along Palm Bay. It starts with a huge blast of colour to get participants on their way before they run, jog or walk through brightly coloured paint clouds at each colour station. After finishing each entrant will receive a medal as a thank you for taking part. Those taking part will be given a white t-shirt, paint and glasses at registration on the day, along with a running number. Fancy dress is optional but always encouraged! Registration will be open 9am – 11am. The 5k Colour Run takes place 11.30am – 1.30pm. To take part email karen.kenward@pilgrimshospices.org, call 01843 233 934 or click here.